With the income of an apprentice opera singer, a wife in non-profit, two car payments and a newborn daughter, our first few months in Houston required us to save our pennies whenever possible. Mostly that meant we drank cheap beer and ate even cheaper mexican food, but one of my very favorite budget-friendly meals from that time was a simple yet fantastic sandwich from a wonderful little vietnamese restaurant called les Givral's Kahve. 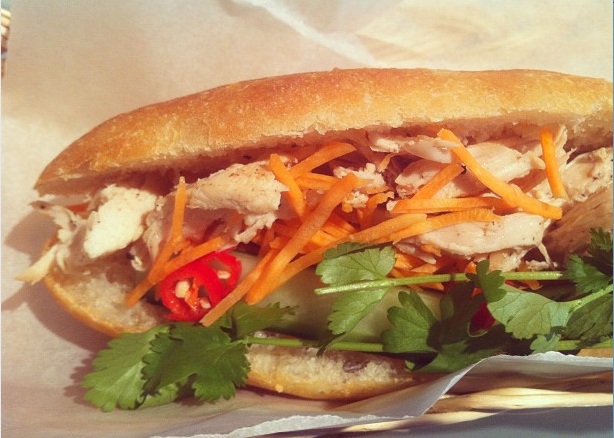 It's filled with either shredded pork or chicken, carrots, cucumber, cilantro and sliced raw hot peppers (!) but the star is actually the bread. 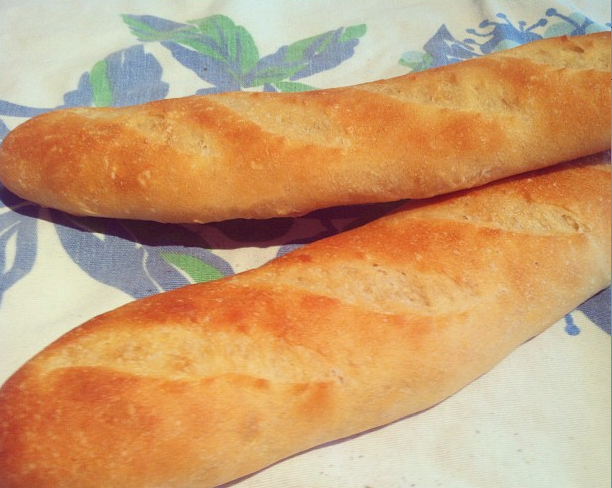 It's a light baguette with thin and slightly crackly crust and a soft, sandwich style crumb. The price? Two bucks. I can't even make it at home for that cheap but at the moment I can't just go walk down the block to les Givral's to pick one up since I am in the land of no-cheap-yet-yummy-vietnamese-sandwiches-but-may-I-offer-you-some-very-fancy-and-expensive-cheese-dip-instead called Switzerland. So I'm doing it myself. 2. Mix in the sugar and salt. Do about 5 or 10 minutes of french slap-n-fold style knead (so you don't have to add extra flour) until you have a medium level of gluten development. 3. Let the dough rise until it almost doubled, then punch it down shape into a ball and let it rise again. You can skip the second rise if you want, but it makes the crumb fluffier which is nice for this bread. Each rise should take around an hour depending on your room temp. 5. Let it proof until it passes the poke test (ahem), about 45 minutes to an hour. 6. Preheat your oven to 375. We don't want super thick dark crust on this and it the sugar will cause it to brown fast, which is the reason for the lower temp. Put the dough on a pizza peel or parchment paper, slash it, put it in the oven with your favorite steaming method for 20 minutes, then without steam for about another 5 or 10 minutes until it's golden brown and it sounds hollow when you knock on it. 7. Let cool for at least 20 minutes, then cut it length wise, but not quite all the way through, so it opens like a hot dog bun. You can use any type of meat you like, or just vegetables, it's up to you. To copy my favorite version of this at les Givral's I used chicken breast, which I just poached lightly in broth until it was cooked through, shredded it and tossed it with salt and quite a lot of pepper. Then add shredded carrots, sliced cucumber, sliced hot peppers (as many as you can stand) and a good bunch of fresh cilantro. Finish with a squeeze of fresh lime juice. If you happen to be in Switzerland, enjoy with a crazy cheap yet crazy strong (8.8%) and tasty Starkbier. 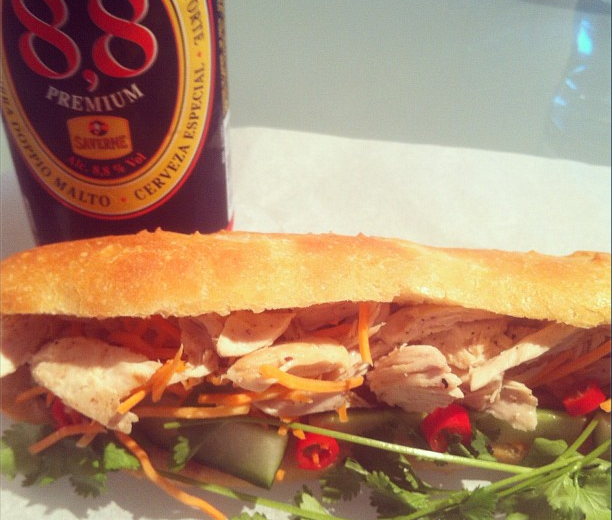 You seriously made your own Vietnamese sandwich a la Les Givral? I am mad impressed. And you are welcome over to my house to make me bread any time. My Ryan and I have ventured into bread making a few times, but I have to say, we have not been so adventurous. Your website is beautiful, and I plan to be back for more soon. Thanks Chris! You know, it really helps if you don't have a real job and you have a lot of time on your hands. 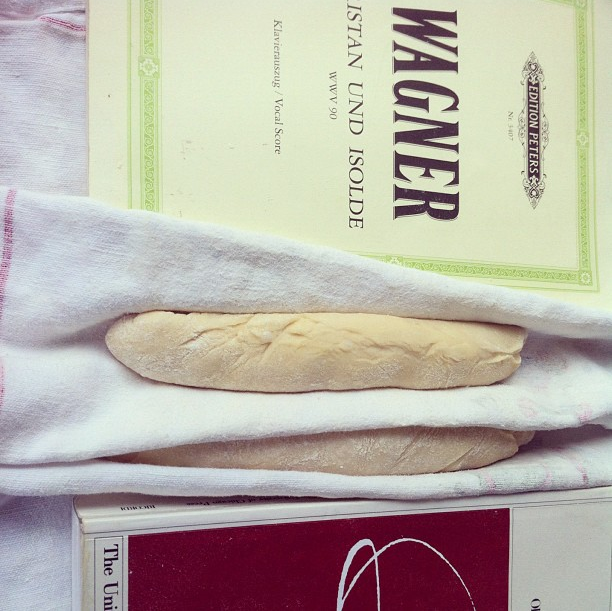 We'll all have to hang out and make some bread together when we're back in town in the spring.